Tel: 012-311 2837Business hours: 6.00am to 11.00pm daily. CHETTINAD cuisine is among the spiciest and most aromatic because of the variety of spices used. It is typically characterised by the liberal use of oil and spices with generous amounts of peppercorn, cinnamon, bay leaves, cardamom, nutmeg, green and red chillies. The hot and pungent dishes are an essential part of a truly authentic Chettiar meal. 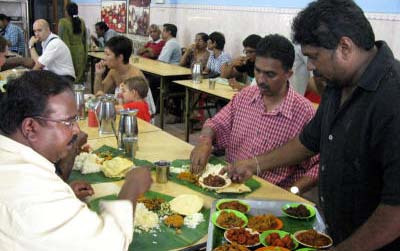 Most of the dishes are eaten with rice offer a variety of mouth-watering vegetarian and non-vegetarian food, served only on banana leaves, in keeping with tradition. 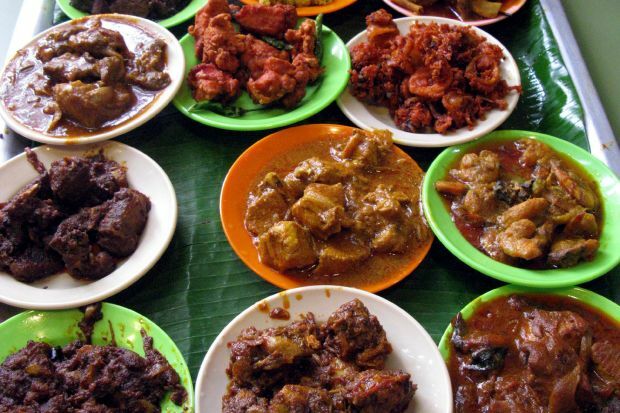 If you want a memorable Chettinad meal in Kuala Lumpur, try Vishalatchi Food and Catering along Jalan Scott in Brickfields. According to restaurant owner C. Ramanathan, the numerous delectable dishes transcend the boundaries of Tamil Nadu. The menu here resembles the life of Chettinad people from villages in Tamil Nadu. The three cooks at the outlet are from Tamil Nadu and the spices used are imported, making a meal at Vishalatchi as original as it can be. “We have been in this business for 10 years and our customer base has grown over the years because we have kept to originality. Most of our customers are die-hard fans of Chettinad cuisine,’’ said Ramanathan. Tucking in: At Vishalatchi, dishes are served on banana leaves on a long communal table. Customers can opt for Vegetable Pirattal, also known as Vegetable Masala, a very common side dish which can be found in any Chettinad home. It is often prepared with an assortment of vegetables, though sometimes with just potatoes and carrots. Ramanathan said if one has a penchant for Chettinad food, then be ready to eat like a Chettiar. “Chettiar hospitality is legendary and any occasion is a reason to feast. There will be hundreds of dishes served. “It is the same here, a reason to feast with a minimum of 15 dishes at any one time. The price is also reasonable although we serve a lavish spread every day,” said Ramanathan. At Vishalatchi, dishes are served on banana leaves on a long communal table. The sounds of prayers being carried out in a nearby Hindu temple complement the setting perfectly. The spicy Chettinad food is prepared with the distinctive hand of the “achi” (experienced female cooks in Chettinad) leading our tastebuds on a journey of intrigue and delight. Several variations of fish, mutton, crab and chicken dishes were served but Ramanathan said the all-time favourite is the Mutton Chop, dipped in egg batter, which was infused with ginger and chilli. The sharkfish is another favourite at the restaurant. “The entire fish is deboned and made into cutlets. “Also on the list is nathu adu or mutton dish,” said Ramanathan. The restaurant’s chicken briyani is served every day while its nathu adu briyani is available on Sundays. Those looking for some good Chettinad breakfast should try the idly, which is soft and fluffy.